KMZ, Zenit-E, 35mm SLR. Photograph gallery. 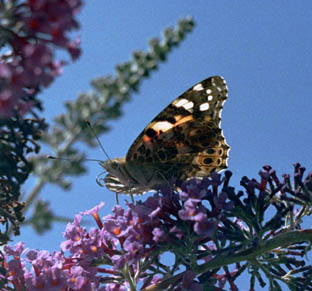 Painted Lady butterfly, one of the UKs migratory species, gorging itself on a Buddlea. 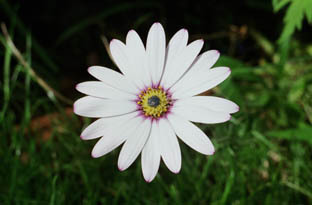 A selective enlargement representing about 30% of the negative area. 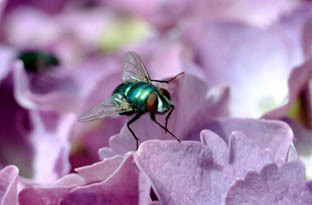 This was taken with the Zenit's standard 50mm Helios, but with 30mm extension tube fitted. Close up photography is fascinating and a sure way to waste whole rolls of film. Having said that I only took this one shot of this chap. Oh well, while we are playing around with the extension tubes here's a wonderful little green fly. The Zenit E is a perfectly usable camera, the Helios 44-2 lens is very good but benefits from a lens hood to help reduce lens flare. It's amazing what you see when you look at a close up photograph, this is an enlarged section of the shot at left. 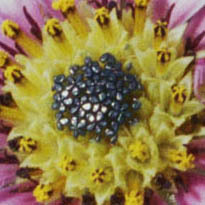 The black cluster in the centre measures about 1.5mm across on the original negative. Enough of the close up stuff. The Zenit's good enough for everyday use - just remember that it won't stop down automatically. I get caught out for a few frames on each roll because I am always switching between cameras. You can pick up a Zenit E for almost nothing, the body is okay and the lenses lovely. Just a touch of lens flare creeping in from the bright sky between the trees.